The most complete RF power measurement package offered by Bird Electronic. The 4410A is similar in construction, design, and size to the industry standard Model 43. Using special broadband elements the 4410 wattmeter measures multiple power ranges with each element. However, with this kit there are no extra elements to buy, all the elements normally required are included in the kit. More accurate power measurements can be made by simply switching the meter to a power range compatible with the power being measured. The Model 4410A uses special broadband elements to cover a wide frequency range and power range. Temperature-compensated accurate CW and FM power measurements from 200 kHz to 2.3 GHz and 2 mW to 10 KW. Uses special 4410-series wide-range elements. Wide-range accuracy over a 37 dB dynamic range. Quick Change (QC) connectors to minimize the need for adapters when making critical measurements. UHF connectors included (SO-239) for HF. Broadband multiple power range with a single element providing 7 power ranges using the switch on the front of the meter. 10kW Element Bird 4410-4 (New) for 2-30 MHz included. Power ranges 10W, 30W, 100W, 300W, 1000W, 3000W, 10,000W full scale. More elements available, sold separately, 200 kHz-2.3 GHz. Temperature-compensated accurate CW and FM power measurements from 200 kHz to 2.3 GHz and 2 mW to 10 KW. Uses special 4410-series wide-range elements. Wide-range accuracy over a 37 dB dynamic range. Quick Change (QC) connectors to minimize the need for adapters when making critical measurements. Type N(F) connectors included for VHF/UHF. Broadband multiple power range with a single element providing 7 power ranges using the switch on the front of the meter. 1kW Element 4410-8 for 200-1000 MHz included (New). Power ranges 1W, 3W, 10W, 30W, 100W, 300W, 1000W full scale. 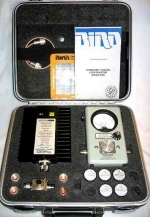 This package is complete with five elements that provide coverage from 0.45 MHz to 1000 MHz in seven power ranges covering 1 Watt to 1000 Watts (10,000 Watts in 0.45-30 Mhz range). Full scale power ranges of 1 Watt, 3 Watt, 10 Watt, 30 Watt, 100 Watt, 300 Watt, and 1000 Watt with each of the 1000W elements. For the 10000W elements the ranges are 10 Watt, 30 Watt, 100 Watt, 300 Watt, 1000 Watt, 3000 Watt and 10000 Watt. 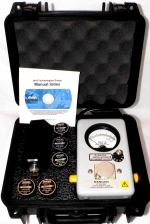 Complete RF power measurement package. The 4410A is similar in construction, design, and size to the industry standard Model 43. 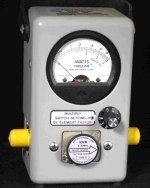 Using special broadband elements the 4410 wattmeter measures multiple power ranges with each element. However, with this kit there are no extra elements to buy, all the elements normally required are included in the kit. More accurate power measurements can be made by simply switching the meter to a power range compatible with the power being measured. NEW Bird 4410A Power Meter and NEW all 5 Elements! The other parts in this kit are refurbished like new. Other parts Used in new condition, 90 Day Warranty.